When I’m confronting a new design problem or thrown into a situation demanding some deep interaction design analysis, I consult a set of starter frameworks that I’ve evolved over the years to help me gain a firm initial footing. They also help me prepare a set of initial questions to help me interpret the situation. 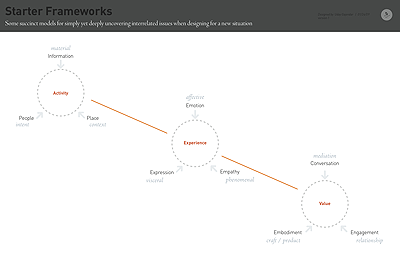 These frameworks succinctly identify the essential issues, focusing on the activity, the experience, and the value thereof. ** The Activity: For example, “Doing a conference call with colleagues at the office” or “Editing photos at home, to share with grandparents”. An activity is typically shaped by three key elements: people (the actor performing the activity, as well as residual/contextual participants, their intent/motive/expectation, etc. ), place (the primary scene of activity, both physically & digitally & even cognitively), and information (the material — content and functionality — that’s being engaged with, at the center & periphery of the activity’s successful completion). ** The Experience: What’s the quality of the encounter? This is typically shaped by the visceral expression of the material engaged with, a sense of empathy for the actor’s experience (assumptions/expectations in particular), and of course the emotional aspect on the activity’s participants in an affective manner. ** The Value: Finally, what’s the resulting value? Value is an admittedly overused term, suggestive of corporate buzzwordism. But in terms of design, “value” is a critical, even the most paramount, issue of all. I believe value arises as an emergent quality of effectively mediated conversation, well-crafted embodiments, and a meaningful engagement that establishes a relationship.